Okay, I wasn't going to be hosting anymore reading challenges (then again I wasn't going to be joining anymore either and that's not happening - LOL), but I broke down and started this one. I searched all over and didn't see one for this yet so I'm going to start it myself. 4) Take the button above and post about it. Use the Mr. Linky at my new blog for this challenge. Click here to sign up and go over there now, but make sure you link it directly to your post about this challenge. ADDENDUM: IF YOU WANT TO LINK UP YOUR REVIEWS OR, FOR THOSE WITHOUT A BLOG, LEAVE A COMMENT WITH YOUR REVIEW, GO TO THE FINISHING THE SERIES BLOG, JUST CLICK HERE. I'm going to bite the bullet and try for Level 2 and complete 2 series. This sounds great! I would love to join this challenge. I'm putting it on my list for 2012...which I'll announce sometime this month...Thanks for hosting. I am so glad that someone is taking on this challenge. Thank you. Great challenge, Yvonne! This is just what I needed! Thanks for hosting! According to my list, it looks like I will need to do this challenge for the next couple of years, LOL! And my list is just going to get longer because there are a ton of new series that I intend on starting in 2012. I am so excited to join your challenge! I have never done this in a formal fashion. I choose Level 2 and I'll be finishing Macomber and Evanovich series. Thank you for the inspiration. Perfect challenge for me, I have most of the books just keep putting them off. I love this challenge. I am behind on a lot of series but am going to start with Stephanie Plum in January!! I'm behind on a lot of series as well, so I signed up for level 3. I'll be posting the series I want to finish over Christmas break. Thanks for the incentive - I'm in! Thanks for doing this challenge again. I finished aboujt 5 series this year. I want to do level 3 this years. Thanks to everyone for joining in. This should be fun! Your challenge is perfect for me! Last December I made up my own personal "Catch-Up 11 in '11" challenge to finish 11 series in 2011; this time I'm challenging myself to finish "12 in '12". Last year I joined a challenge to start more series...now I have all these half-read series on my list! This challenge looks perfect for getting to the end of some of those stories. Oh, this is right up my alley. I have a few series that I want to finish. But, I think I will just do level 2, Complete 2 series. Howdy! Thought this was a great idea and wanted to join in. I really like the idea of this challenge, so I signed up - I'm aiming for Level 3, because I'm really late on reading a lot of the great series that have been coming out and others that I should've been reading for some time too, because everyone says they are great! - The Hunger Games, The Books of Pellinor, Starjacker, Hush, Hush and some others. Thank you so much for hosting this challenge. You have no idea how badly I need to finish the series that I have started, and I keeping starting more and more series, instead of finishing before moving on. It's gotten really bad and I've made a resolution to stop that in 2012, so it was perfect that you came up with this challenge. I am definitely doing a level three which will be a piece of cake of me, since I have read so many series, many of which are completed by the author. I'm sure I will be completing a lot more than three, but I'll just commit to three for now, and keep you updated as I complete more. Lemony Snicket's A Series of Unfortunate Events with books 4, 5, 6, 7, 8, 9, 10, 11, 12, 13 to read. Whew! You can see why I need this challenge! Hope everyone enjoys some good reads in 2012. P.S. I don't have a blog, so I'll be posting all updates and linking to reviews on goodreads here. Thanks and toodles! This is such a great challenge for me so thank you for hosting it! I am looking forward to finishing up some great series that I have loved. It was so hard to stick to two series I want to finish this year. I may aim for more, but I was trying to be realistic. We'll see. . . Thank you for hosting this challenge, Yvonne! Thanks for hosting this challenge. I have a few series that I really want to finish, so I am going with Level 3 - hopefully I will be able to finish these and maybe some others! Keep your fingers crossed Janet doesn't pound out another Plum book before you finish! I just signed up - great challenge! Do I link on here with the book reviews as I head toward my goals? Or do I just comment when I finish some as well as update my initial post about this challenge? I'm keeping everything about the challenge over there now. 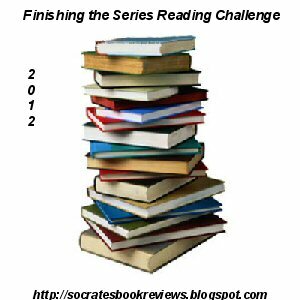 I've started a new series and had to have a reading challenge, so have joined you. I will be going for level 1. My series of books...The Cat Who series. I've posted about this a my place. Have a great day! I did it! 2 series finished! I am going to try for another! Thank you for this challenge! I bit off a bit more than I could chew with this challenge but I posted my wrap up today. I plan on joining in again for 2013! I underestimated myself on this challenge...completed 9 (well, 10 if one includes one where the author hasn't finished the series yet! LOL). I've still at least three series in the works, too. Woohoo!